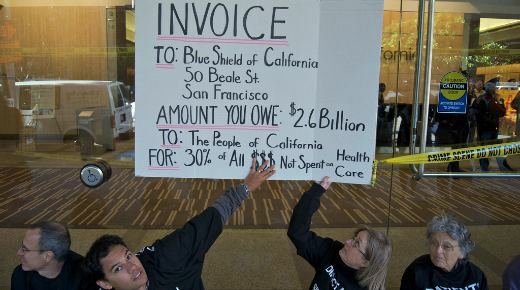 Blue Shield of California’s recent proposal to raise the premiums for nearly 200,000 individual policyholders by as much as 59 percent has sparked a storm of protest and renewed calls for legislation to give state regulators the authority to reject unjustified rate hikes. California’s new Insurance State Commissioner Dave Jones, a Democrat, blasted Blue Shield for seeking “such massive rate hikes during these troubling economic times” that “will lead to loss of health care coverage” for many struggling families. State Assembly Bill 52, introduced in December by Assembly member Mike Feuer, D-Los Angeles, mandates that health care service plans and insurers submit such rate increases to the state for review and approval before being implemented. The bill would also require insurers provide justification for rate increases and would build upon new federal and state law, improving the review process. U.S. Health and Human Services Secretary Kathleen Sebelius, and Reps. George Miller and Pete Stark, Democrats of Calif., joined Waxman in condemning Blue Shield’s action. In 2010, Feuer and then-Assemblyman Dave Jones jointly introduced a measure similar to AB 52 after a proposed rate increase by Anthem Blue Cross. The reform measure was ultimately defeated in the State Senate but, had it passed, it’s unlikely then Republican Governor Arnold Schwarzenegger would have signed it into law. However, Consumer Watchdog president Jamie Court vowed to fight for “legislation this year to do it again,” hoping for the backing of the new Democratic governor, Jerry Brown. Some twenty years ago Consumer Watchdog sponsored and won a state ballot proposition granting the state control over car premiums and other property insurance, according to NPR.